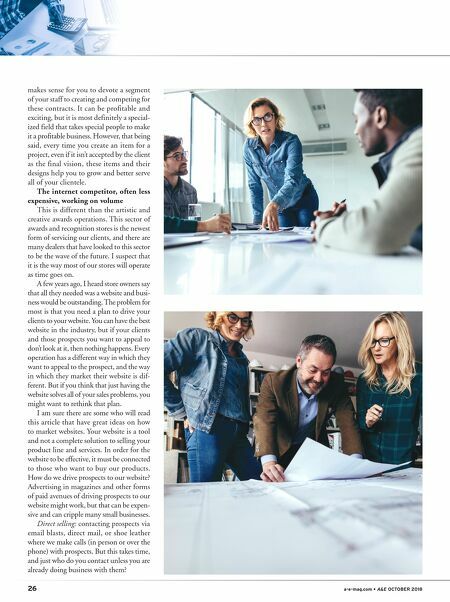 26 a-e-mag.com • A&E OCTOBER 2018 makes sense for you to devote a segment of your staff to creating and competing for these contracts. It can be profitable and exciting, but it is most definitely a special- ized field that takes special people to make it a profitable business. However, that being said, every time you create an item for a project, even if it isn't accepted by the client as the final vision, these items and their designs help you to grow and better serve all of your clientele. The internet competitor, often less expensive, working on volume This is different than the artistic and creative awards operations. This sector of awards and recognition stores is the newest form of servicing our clients, and there are many dealers that have looked to this sector to be the wave of the future. I suspect that it is the way most of our stores will operate as time goes on. A few years ago, I heard store owners say that all they needed was a website and busi- ness would be outstanding. The problem for most is that you need a plan to drive your clients to your website. You can have the best website in the industry, but if your clients and those prospects you want to appeal to don't look at it, then nothing happens. Every operation has a different way in which they want to appeal to the prospect, and the way in which they market their website is dif- ferent. But if you think that just having the website solves all of your sales problems, you might want to rethink that plan. I am sure there are some who will read this article that have great ideas on how to market websites. Your website is a tool and not a complete solution to selling your product line and services. In order for the website to be effective, it must be connected to those who want to buy our products. How do we drive prospects to our website? 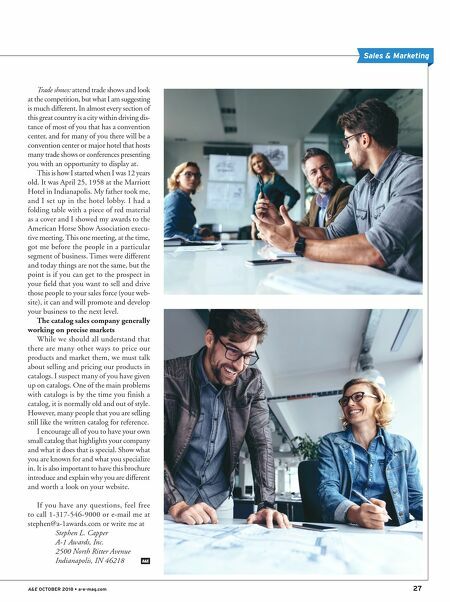 Advertising in magazines and other forms of paid avenues of driving prospects to our website might work, but that can be expen- sive and can cripple many small businesses. Direct selling: contacting prospects via email blasts, direct mail, or shoe leather where we make calls (in person or over the phone) with prospects. But this takes time, and just who do you contact unless you are already doing business with them?